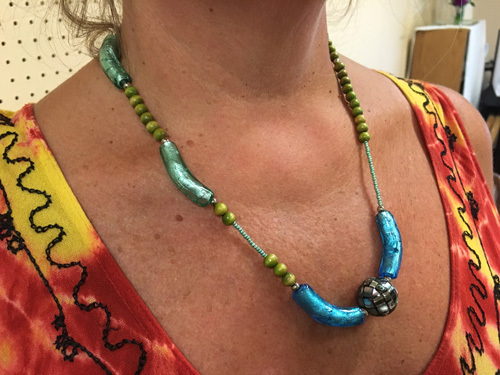 Last Friday's class at Iguana Beads was a lot of fun for all of us who attended including me! All the students had never ever made any jewelry before. But it was not just about learning how to make a necklace. Yes, they were introduced to the basic tools, components, findings. More than that, they were given tips on how to approach jewelry designing. The goal was not to walk out with identical pieces! 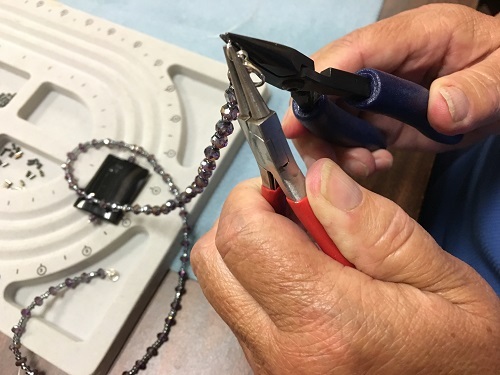 One of the best exercises for creating jewelry is to be presented a design challenge. You see this on many blogs. It could be responding to a theme or as in the case of these students - working from a design challenge tray. 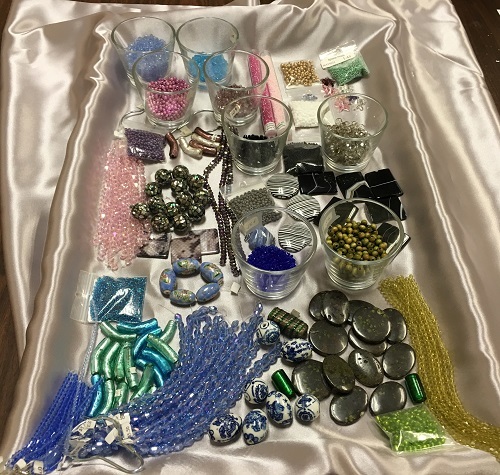 This was put together by Crissy, the owner of Iguana Beads. She also helped out with this class! Learning how to handle unfamiliar tools is one lesson! 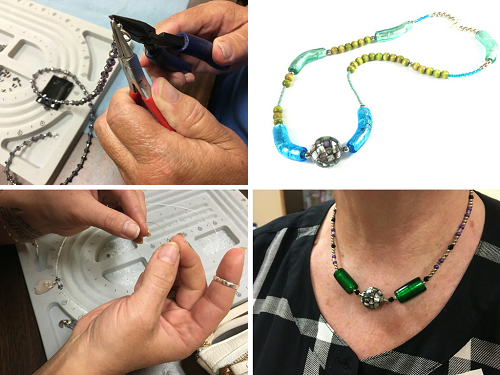 The students quickly learned making your own jewelry means you can make it as long or as short as you want! 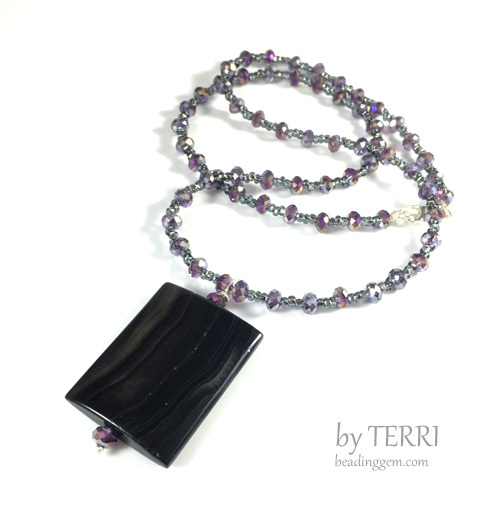 Terri made a long crystal necklace to go with the large pendant she wired up. Another thing they learned is not to be afraid of doing something different. Candice had the confidence to go with an asymmetrical necklace. 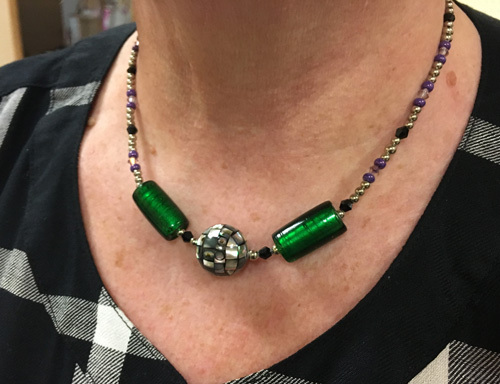 While designing her necklace, Lynn discovered by herself that purple and green do go together. Her choices were guided by the purple and green tinged iridescence of the central mosaic Paua (New Zealand abalone mother of pearl) shell bead. You know how you sometimes have to be in the mood for certain designs? Well, Sarah was definitely in mood for a bracelet rather than a necklace. 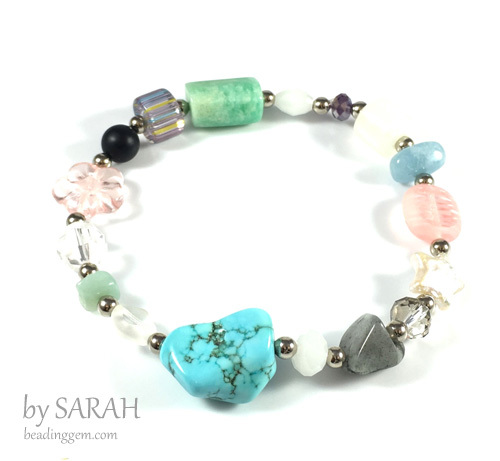 So she had fun picking an eclectic bead combination for her stretch bracelet. Laura settled on a sweet rose quartz nugget for her choker. She enjoyed the wiring portion of the pendant and appeared to have a natural affinity for wire. 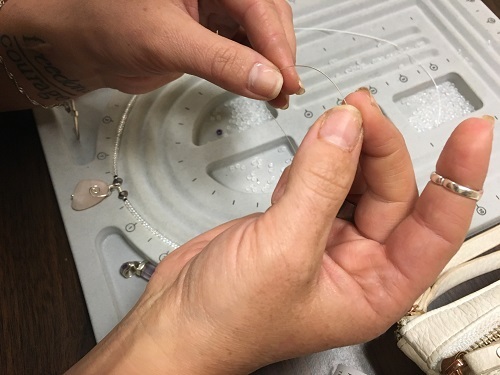 So she will definitely be interested to find out about upcoming beginner wire work classes at Iguana Beads. I captured all these pictures with my iPhone 6S in artificial light using my Modahaus TS320 tabletop studio. Luckily Iguana Beads had two good lamps. Even so, some of the designs were tricky to capture with only a few minutes available for each design! Teaching has always been a joy for me. I firmly believe it makes me a better blogger too. Nice work, students! Great job, Teach! I learn from the students too! Sometimes they come up with some novel ideas simply because they haven't been hampered with preconceived ideas! Wonderful designs! Even more wonderful for being their first time beading! You've obviously done a good job teaching Pearl. No surprise there whatsoever! You're all so lucky to have Iguana Beads close at hand. I'm pea green with envy! It is important to support the local bead shops who have tremendous competition from online sites. Much, much better to see beads up close before purchasing!! I like that everybody can make their own design. I visit some evening classes locally and we all make the the same piece :( Beautiful creations, I love the eclectic bracelet most!